Hey there, friends! I promised that I would go into more detail on why I use MailerLite as my email marketing provider, and today is the day! If you read my post on How and Why To Build an Email List, you know that I use MailerLite for my email list, and I am very satisfied with it. I started out using MailChimp, because so many bloggers recommended that as the best free option. I quickly learned that MailChimp wasn’t for me, as had a hard time figuring it out. Maybe it’s just me! Anyway, I then found MailerLite and was amazed at how simple everything was. MailerLite has autoresponders, even on the free plan. An autoresponder is an email or a series of emails that go out to your subscribers automatically, after you set them up. Mailerlite offers autoresponders even in the free plan. This is the feature I use most, along with the landing pages. When someone signs up for my list, I can set up a series of emails to go out to them, whether it be daily or monthly or after a certain trigger. You can chose a specific time based on when they sign up. MailerLite has 24/7 customer support. I have used this quite a few times! I have been very impressed by their customer service. Chat support is very helpful for me, as I can’t always chat on the phone or reply via email as quickly as I would like. They are very quick to respond, usually within minutes. This is offered even on the free plan, which is something that MailChimp doesn’t do. MailerLite has landing pages (free)! This was the biggest reason I went over to Mailerlite. I was so impressed with the fact that they offer landing pages, even on their free plan! And they have so many options for landing pages. You can design them how you want, with their drag and drop feature, or you can use one of their templates. I thought this was an amazing feature they offered, as I had originally been told I needed to use an email provider and a stand alone server for landing pages (like Leadpages). Landing pages convert very well so it is a huge benefit to have the option to customize landing pages for free. HERE is an example of one of my landing pages. This will take you to an editorial calendar. MailerLite has an unsubscribe page builder. I know everyone hates when people unsubscribe from their list, but that is the life of business owner. It is going to happen and you need not let it bother you. It happens to all of us. To make it a bit simpler, MailerLite even has an unsubscribe page builder, letting you customize your email subscriber’s entire experience from beginning to the unfortunate end. MailerLite has a LOT of features, even free, that others don’t have. MailerLite is free up to 1,000 subscribers. Free is always helpful when we are just building our business, right? Like I said before, I did go with Mailchimp at first because it was free and recommended by others. MailChimp has a free plan, but lacks some important features, like landing pages. ConvertKit is a great platform designed for bloggers, but it costs $29 per month just to get started (although they do offer a free trial). The table below shows how MailerLite’s prices compare to ConvertKit. I don’t know about you, but any money I can keep in my family’s pockets, I appreciate! New Features being added constantly! Convertkit does have an amazing feature called “tagging.” Tags allow you to organize and group your subscribers based on actions, interest or more. You’ll be happy to know that MailerLite just announced “What’s coming up” and tagging will be available soon. I am so excited about this! This will be awesome! Click here to check out MailerLite today! I am not trying to convince you to switch to MailerLite. I know how much of a hassle it can be to switch providers! If something is working for you, stick with it! However, if you have not started your email list yet (ahem…read why you NEED to now) OR you are not happy with your current service, I highly encourage you to consider MailerLite. I am all about simple. Oh, and as a bonus for you, I have FREE CHEATSHEET that will help you explode your email list like a pro! Grab that right here and get ready to Launch Your List! IF YOU WANT TO LEARN HOW TO EXPLODE YOUR EMAIL LIST AND CREATE SALES ON AUTOPILOT, CHECK OUT EMAIL SIMPLIFIED! I’m loving Mailerite! They’ve been extremely helpful every time ask a question- AND they reply within minutes! Thank you so much for telling me about them, Terryn. I don’t believe it is yet, but I would say go to MailerLite and use their chat feature to ask. They are really quick to answer! I’ve been using MailChimp for my basic needs, but this post got me to thinking! I hadn’t even heard about MailerLite! I know it, I hadn’t either! I have never heard of MailerLite, and I just started exploring MailChimp. Maybe I’ll swtich. Hi! I started to sign up for mailer lite – but it wanted a whole bunch of information about your company and what you’ll be posting. I asked them if they need that and they said yes in order to approve people. But what if you don’t have a company – it’s just you, with a blog you are trying to get off the ground, and a mailing list of about 250 that you send monthly newsletter/updates to? Or is it not for that purpose – it’s strictly for business? Hi Allison. I don’t remember giving that kind of info when I signed up??? I only use it for my blog mailing list. Did you try using the chat feature? They are usually very quick to respond. Hi! Thanks for getting back to me so quickly! I did chat with them, they said that they need all the fields completed for the approval process. If it doesn’t match up with their criteria then they won’t approve it. Did you sign up with them recently or a while ago? Maybe they’ve gotten so popular that they are screening more carefully. But I wasn’t 100% sure I am going to move…yet…. Thanks for this post! 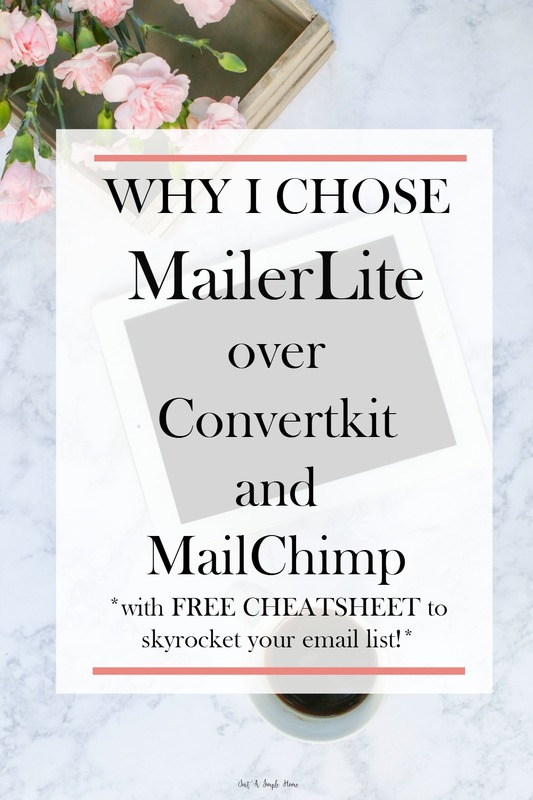 I use MailChimp as well and I hadn’t heard of mailerlite, but this is really making me consider switching! I have been frustrated about things like autoresponders and such as well and the more I use MailChimp, the more I feel like it doesn’t offer enough. It’s great to know there is another free option out there until I hit the minimum threshold for payments! I hear you. I was so happy to fin Mailerlite, I just couldn’t figure out MailChimp. Even when you get to 1000 subscribers, it is still only $10 a month. I’m hearing more about mailerlite and because of the cost I am strongly considering switching from ConvertKit but I’m worried about how much time it will take. I have a long list of upgrades shared throughout my blog. This isn’t too bad but I’m worried about the pins I’ve posted that go directly to content upgrades and not blog posts. Did you have to deal with this at all? I wanted to switch one of my sites over to MailerLite, but they only allow up to 10 RSS items in one newsletter. I need at least 50, so I had to go back to MailChimp. I’m hoping they will change this limit in the near future. I started with a handful of subscribers at Mail Chimp and it baffled me. I moved over to Madmimi and have been considering ML because others have recommended it and then someone linked me over to your blog. Price is a big issue and getting most of the same functions as other email providers at a fraction of the cost is a big plus. Getting this done as soon as I can figure it all out! Hey! I hear you! MailerLite is super simple, after the first few days 🙂 Definitely use their chat, they are great. If I can help, let me know! Hi Terryn – I think I’m a good candidate for Mailerlite but wanted your quick opinion. MailChimp for WP came with my premium theme so I thought thats the way to go. But, I have been frustrated with trying to create anything! I finally got a pop up to appear but I’m still not sure how that happened! I also want the landing pages. So, since you have switched back and forth, is it easy to just deactivate one and activate the other (once I’ve set up an account, that is!). Thank you for any help you can provide! Oh, and I have a whopping 7 subscribers so far – did I mention I’m new to this? Haha! Thank you so much for this valuable info. I’m just starting my site up now and find mailchimp to be slightly overwhelming. I’m not technologically savvy, just looking for a way to express some creativity on my site. I’ll be checking out mailerlite! Great post! I am currently in between mailerlite and convertkit. I got a free trial for convertkit and thought I should try it out because everyone was raving over it. But I started with Mailerlite initially. I actually really liked Mailerlite except for the forms. I didn’t find the forms that easy to integrate directly into WordPress. Are you using different forms than he ones in mailerlite (besides the landing pages)? Hi Sasha! All of my forms are from MailerLite. I mostly use their embedded forms. They are really easy to use. Have their customer service walk you through building one and it will take you minutes the next time. Hi Terryn, how do you find your email open rates and deliverability using MailerLite? Also, how do you send opt-ins if you cannot attach PDFs? Do you link them to dropbox or google drive downloads?